The intratumoral immunological landscape is increasingly being recognized as a major contributor to cancer development and progression. The concept of cancer immunosurveillance suggests that tumors are constantly eradicated by the immune system before clinical manifestations occur. 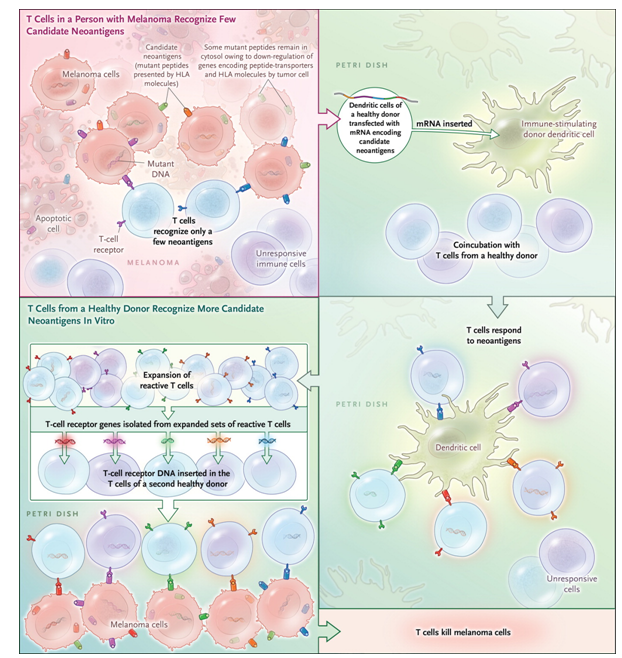 However, leukocytes, which were once thought to be only implicated in cancer eradication, are now recognized for their dual functions in tumor promotion as well as inhibition. In addition, cross-talks between the different immune cell types and the tumor cells are still poorly understood, as an example why T-cells from a melanoma patient recognize fewer neoantigens than the T cell of a healthy donor remains to be understood (Figure 1). Given the increasing importance of immune constitution for the success of chemotherapy and targeted treatment, we study the cross-talks between the different immune cell types and the tumor cells. Our previous results demonstrated that the T-cell response and interleukin signaling pathways are important component to discriminate Her2 negative patients into groups with different prognosis. Following studies showed that mutations in the tumor suppressor TP53 (mutated in approximately 30% of breast adenocarcinomas) could influence the lymphocytic infiltration in ER-negative breast tumors (Figure 2). These results underline the dependence between immune cells infiltration and tumor cells characteristics. Figure 2. TP53 mutation status is associated with differential immumne cell infiltration in in Basal-like tumors. 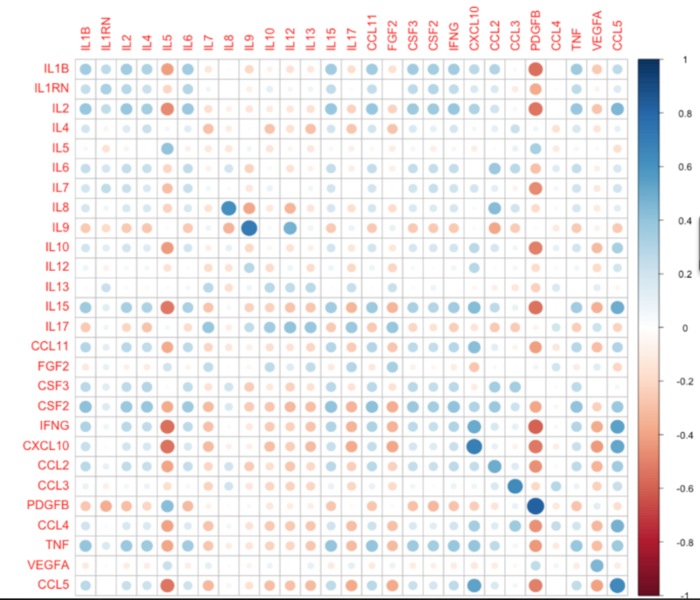 To elucidate mechanisms linking inflammation and cancer, we analyze cytokines levels in the plasma of breast cancer patients. We are comparing the levels of 27 cytokines in the plasma to the estimate immunological type observed in the core biopsies (Figure 4).This assessment of plasma levels of cytokines led us to discover that low levels of the chemokine IP10 is related to poor survival in breast cancer patients with luminal subtypes (Figure 5). We also monitor the changes in cytokine levels in the plasma during and after treatment with targeted therapy Avastin. Figure 4. Comparison of cytokine levels in the plasma to their mRNA levels in the corresponding biopsied tissue (unpublished). Figure 5. Plots for KM survival analysis with log rank test, KM survival curves shown over time on x-axis. (A) KM curves for overall IP10 serum levels distribution over time relative to cumulative survival. (B) KM curves for IP10 levels in ER positive tumor bearers (C) in PgR positive (C) in HER2 negative and (D) in luminal subtypes, A&B collectively (unpublished). In total, our current and future research aims at using state-of-the-art in vitro (T cell Repertoire Sequencing, Nanostring…) techniques and in silico tools to accurately identify the immune cell types infiltrating tumors and their role in tumor pathogenesis. In parallel, we aim at developing non-invasive methods to characterize predict how the immune microenvironment affects breast cancer development. 1. The Antigenicity of the Tumor Cell - Context Matters. 2.Integrated molecular profiles of invasive breast tumors and ductal carcinoma in situ (DCIS) reveal differential vascular and interleukin signaling. 3.Lymphocyte Invasion in IC10/Basal-Like Breast Tumors Is Associated with Wild-Type TP53.